The way we learn is changing. By allowing us to more easily share information and acquire knowledge, the Internet has made it easier to learn informally. Moving away from the traditional academic model, we are increasingly learning from each other and on the job. 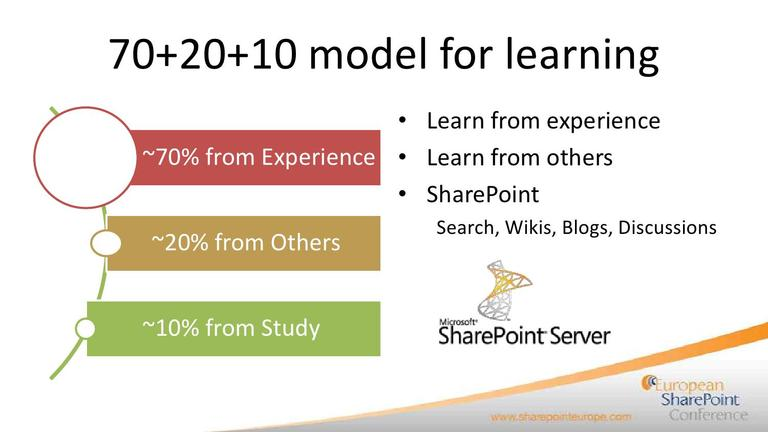 Microsoft SharePoint’s popularity as a collaboration environment for everyday work tasks makes it a readily available environment for learning functions — an idea that fits in well with the 70+20+10 learning model. 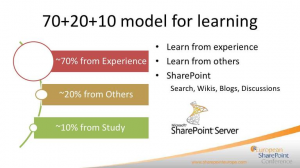 Assessments also fit in well with that model, and with SharePoint, too. Many types of assessments can work well with SharePoint – everything from quizzes, diagnostic tests, knowledge checks and competency tests to surveys and course evaluations. No matter what the setting – a formal learning program, regulatory compliance, performance support or an employee/partner portal, perhaps – assessments have key roles to play. How to include assessments in SharePoint? • Custom web parts – write your own! If you would like to learn more about using assessments within SharePoint, you can check out this Questionmark presentation on SlideShare. For more details, download the white paper Learning and Assessment on SharePoint or visit John Kleeman’s SharePoint and Assessment blog. I’d like to draw your attention to a thought-provoking article in the New York Times earlier this week about the best way to learn. One interesting observation in the article is that although you might think going and staying at a quiet place to study is the best way to learn, this isn’t the case. It’s actually easier to learn if you move around to different places! It would seem that when the outside context varies, it’s easier to put on the neural scaffolding that helps retain something in memory. And, mirroring papers by Dr. Will Thalheimer commissioned by Questionmark (see The Learning Benefits of Questions and Providing Learners with Feedback), tests also help the retention of learning. In particular the New York Times describes an experiment at Washington University in St. Louis where two sets of students studied a reading passage in different ways. One set studied it twice in back-to-back sessions, the other set studied it once and then took a practice test on it, within the same time. As you can see in the diagram below, students who studied only learned the information well at the time, but forget about half of it within a week. But those who studied and had a practice test, retained much more of the information. 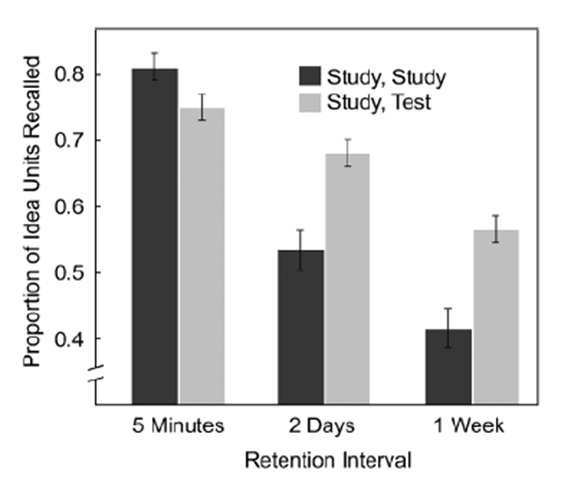 The bottom line from the research is that taking memory tests improves long-term retention. 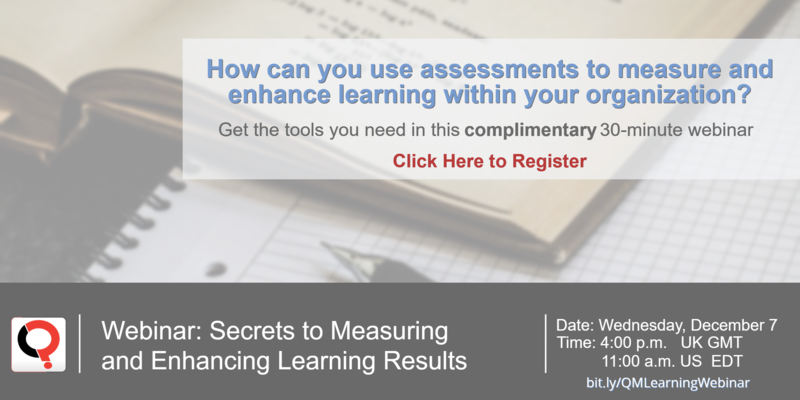 Tests don’t just measure learning: the act of taking a test helps you retain information you have learned.